Gold is fairly widely, though irregularly, distributed throughout Southeast Asia in igneous and metamorphic hard rock deposits and in sedimentary placer deposits. The region was known to the Indian merchants of the 1st millennium BPE as Suvarnabhumi: ‘Land of Gold’, which is thought to refer to the mainland, including lower Burma and the Thai Malay Peninsula, and Suvarnadvipa: ‘Islands of Gold’, which may correspond to the Indonesian Archipelago, including Sumatra. The historical sources inform us that the Chinese were clearly impressed by the quantities of gold present, and there is evidence to suggest that the gold deposits were one of the stimulating factors in the development of early contacts with India and China. Gold first appears in the archaeological record in 400 BPE, at about the same time as iron, semiprecious stone polishing and glass working, suggesting that the techniques of gold extraction and working were quite plausibly introduced to Southeast Asia via Indian and/or Chinese merchants seeking gold ores. L’or est d’une façon irrégulière plutôt abondant dans le sud-est de l’Asie, grâce à la présence de gisements de roches métamorphiques et ignées et à des placers de nature sédimentaire. La région était désignée par les marchants Indiens du Ier millénaire comme Suvarnabhumi : ‘Terre de l’Or’, ce qui doit correspondre à la partie continentale, comprenant la Birmanie et la Péninsule de Thai Malay, et comme Suvarnadvipa : ‘Îles de l’Or’, ce qui peut correspondre à l’Archipel Indonésien, comprenant Sumatra. Les sources historiques nous renseignent que les Chinois ont été clairement impressionnés par les quantités d’or de ces régions, et des évidences suggèrent que les gisements d’or étaient un des facteurs stimulant les premiers contacts entre l’Inde et la Chine. L’or apparaît pour la première fois cité dans les sources archéologiques en 400 BPE, sensiblement en même temps que le fer, le polissage de pierres semi-précieuses et le travail du verre, ce qui suggère que les techniques d’extraction et de travail de l’or ont été vraisemblablement introduites dans le sud-est de l’Asie par des marchants Indiens et/ou Chinois à la recherche de minerais d’or. 1The words ‘gold’ and ‘golden’ are often associated with place names throughout the Southeast Asian region – Ptolemy’s Geography refers to the ‘Golden Khersonese’, and an early name for Thailand is Laem Thong, which translates as ‘golden peninsula’. 2Gold is fairly widely, though irregularly, distributed throughout Southeast Asia in igneous and metamorphic hard rock deposits and in sedimentary placer deposits. Luzon and Mindanao in the Philippines, the Barisan mountain range in west Sumatra, western Borneo, Timor, parts of the Malaysian and Thai Peninsula, northern Burma, north and central Vietnam, Laos, northwest Cambodia in the Oddar Meanchey province, near Banteay Chhmar, its north-central area, in the Preah Vihear province in Rovieng district, and in the northeast in Rattanakiri province have all acquired a reputation as gold producers at one time or another, and the majority of these still produce small amounts of placer gold (Bronson, 1992: 83; Miksic 1990: 12-13; 2003: 19; Reinecke et al., 2002: 222; 2009a: 113-114; Workman, 1972) (Fig. 1). Figure 1: Map showing the gold producing regions of Southeast Asia. Figure 1 : Carte avec localisation des régions productrices d’or du Sud-est de l’Asie. 3There is some evidence of ancient gold mining in Southeast Asia – ancient shafts have been reported in Central Vietnam at Kham Duc (pers. comm. local villagers), an area which is linked by the river to the protohistoric sites of Go Ma Voi, and at Go Mun, 65 km southwest (Nguyen Kim Dung et al., 1995; Nguyen Kim Dung, 2001). In addition, Classical gold coins are reported to have been found near the mines of the Rejang area, Bengkulu, in southwest Sumatra (Miksik, 1999: 17). Most recently, Iron Age bronzes were found in a mine shaft in Laos, at the Sepon gold and copper mine, known as the ‘Dragon Field’ (Thong Na Nguak) on the 11th of April 2009 (UCR, 2009). The mine shafts were reported to be extremely well preserved, having been waterlogged and unexposed since the time they were abandoned. 4Most of the gold in the prehistoric and early historic periods would, however, undoubtedly have been extracted by panning alluvial sediments, a technique requiring little capital investment in equipment and no specialist technology, but unfortunately leaving no discernable archaeological signature. Many of the secondary deposits, which are today regarded as containing too little gold to be worked commercially, would have been quite successfully panned in the past. Today, the economic viability of gold panning will in part be determined by the price of gold on the international market1. When gold prices are at their highest, it becomes more economically viable to pan the streams – the villagers sell their gold to middlemen who themselves sell on to merchants, and the number of transactions through which the gold may pass before finding its way to a town jeweller may be considerable (Fig. 2). 5Historical sources inform us that the Chinese were clearly impressed by the quantities of gold available in Southeast Asia, and one of the earliest recorded descriptions of the pre-Angkor Funan Kingdom is that of the Chinese emissaries who visited it during the Jin Dynasty (265-419 PE). They referred to the Funan Kingdom as having already expanded its sphere of influence to encompass parts of the Malay Peninsula, and as having a tax on gold, suggesting that the metal was readily available, if not locally produced. “There are many walled towns, palaces and houses… They mostly take their food on silver utensils. The taxes are paid in gold, silver, pearls and perfumes” (Dube, 2003: 17). Another early Chinese text, known as “The History of Southern Ch’i”, which was written in the fifth century, described the inhabitants of Funan as having gold, silver and silk: “The inhabitants of Funan make rings and bracelets of gold and plates of silver” (Cœdès, 1968: 58). 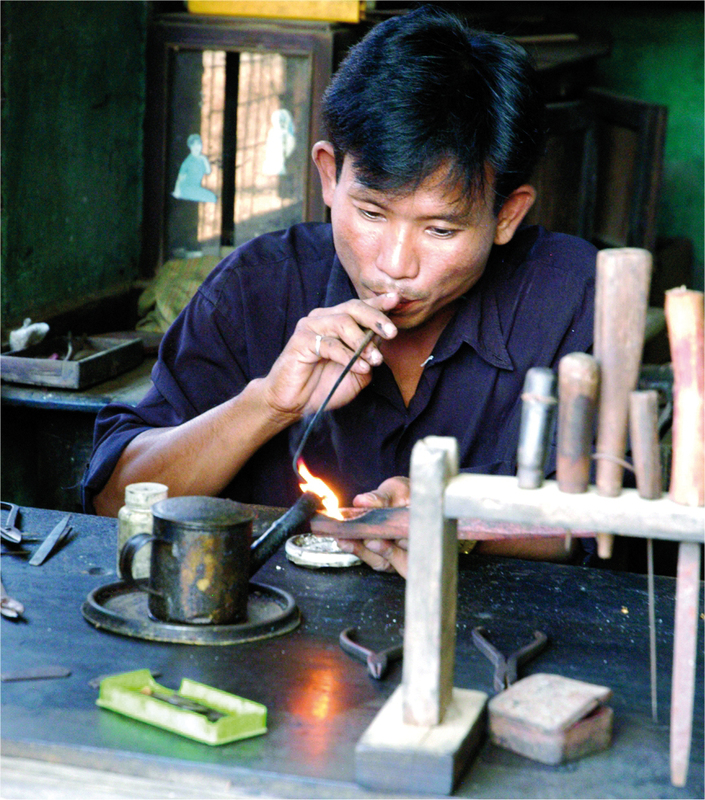 Figure 2: Myanmar jeweller producing gold beads which stylistically replicate ancient ones. Figure 2 : Orfèvre à Myanmar fabricant des perles en or stylistiquement identiques aux anciennes. 6It seems quite probable that the gold ores available in Southeast Asia were not only partly responsible for the early trade with China, but that they were one of the stimulating factors in developing early contacts with India. The Ramayana mentions Sugriva sending his envoys to Hiranyanabha Mountain to the east, i.e. in the direction of Southeast Asia, which was known to be rich in gold, in search of Rama’s wife Sita. Sanskrit synonyms for gold, such as Hiranya, Kanaka, Hema and Suvarna, have been used to name rivers and mountains containing either alluvial or vein deposits of gold, and the region was known to the Indian merchants of the Mauryan Empire (321-185 BPE) as Suvarnabhumi: ‘Land of Gold’, which is thought to refer to the mainland, including lower Burma and the Thai Malay Peninsula, and Suvarnadvipa: ‘Islands of Gold’, which may correspond to the Indonesian Archipelago, including Sumatra. 7A fifth century Sanskrit text narrates the story of merchants who travelled to Suvarnabhumi by sea. Having crossed the ‘unfathomable’ sea, they arrived at a coast, and embarked on a long voyage on foot, past the forested -foothills of high mountains, which they then crossed, finally reaching a forest and a shallow river rich in gold sands (Dube, 2003). An eighth century Indian text known as the Samaraiccakaha describes a sea voyage to Suvarnadvipa and the making of bricks from the gold rich sands which they inscribed with the name dharana and then baked (Dube, 2003: 6). The sintering of such gold rich sands, by mixing the sand with water, which were shaped into bricks and then baked, would have offered the early gold explorers a relatively easy method of transporting the raw material, which could then be carefully separated from its sand matrix in the more suitable environment back in their homeland, where the workforce would be plentiful. The scale of the sea trade in this early historic period is illustrated by the tenth century text Kathakosa (932 PE), which mentions a voyage with five hundred ships (Dube, 2003, referring to Majumdar, 1936). A further indication of the importance of this trade is related to Indian coinage of this period, which is stamped with the picture of ships (Ray, 1994: Pl 12). 8The interpretation of early travel writings is not, however, always easy. The Javanese embassies to China in 860 and 873 PE refer to Java as rich in gold, although it was in fact devoid of any deposits, and would have had to import its gold possibly from neighbouring Malaya, Sumatra or Borneo, where gold was still being mined in the 19th century and where ancient mining sites are reputed to have been located (Colless, 1975; Miksic, 1999: 19; Manning et al., 1980). In the 14th century, the Sumatran ruler Adityavarman, who had an honorific title of Kanakamedinindra, meaning ‘Gold Land Lord’, is thought to have moved his capital to west Sumatra, notwithstanding the inhospitable coast, because of the rich gold deposits in the Minangkabau highlands (Miksic, 2004). 9Even though Java did not have its own gold deposits, the texts make frequent references to the existence of goldsmiths, and it is clear from the archaeological evidence that this culture had developed a sophisticated gold working technology, which relied on the importing of substantial quantities of metal (Wahyono Martowikrido, 1994; 1999). A gold and silver currency had been in place since the tenth century, and although copper coins imported from China during the Late Classical Majapahit period in the early 14th century replaced it, this replacement seems to have been more for the convenience of small denominations than because of a shortage in the supply of gold. In 1225 PE, the Chinese writer Zhao Rukuo referred to the Majapahit’s commander in chief and his 30,000 soldiers being paid in gold (Miksic, 1999; 2004). Elaborate descriptions of the complex jewellery representing gods, goddesses, kings, queens, warriors and priests were used in the Javanese literary texts and inscriptions to provide to the reader precise information pertaining to the status of the characters concerned (Hinzler, 1999). 10There is some evidence that the early explorers were aware of the differences in compositions of gold. An 11th century Indian text refers to the gold coming from Survarnadvipa as being of different types: of yellow gold colour and white shell colour, which is presumed to refer to the amounts of silver or copper contained in the alloy. An 11th century Sanskrit inscription of the Cham king Rudravarman III at Po-Nagar temple mentions a donation by the king of seven panas of red coloured gold (rakta kaladhautam) and twenty-three kattikas and two panas of gold of superior white gold (sitatara kaladhautam). Majumdar (1986: 158-159) translated rakta kaladhautam as gold and sitatara kaladhautam as silver, but Dube (2003) has re-evaluated the texts and reached a more convincing explanation, of rakta kaladhautam being used for red gold and sitatara kaladhautam for white gold. 11The goldsmith themselves would probably only rarely, if ever, have been able to acquire sufficient capital to control their own stocks of metal and would generally have obtained their gold from the wealthy individual or institution who was commissioning the desired article. Their sources of raw material would have included recycled, damaged, or no longer sought after goods, which may have contained other baser metals, such as copper. It is unclear to what extent the goldsmiths undertook the relatively straightforward process of cupellation, which involves the addition of lead to a crucible of molten gold, which is then oxidised using a blast of cold air. The base metal oxides are absorbed into the lead oxide, leaving the gold with only silver remaining. Certainly touchstones, such as the ones found at Kota Cina in northeast Sumatra (Swan and Scott, 1986), and the one at Khuan Lukpat, Krabbi Province, in Peninsular Thailand, which is dated to the 3rd century AD and has a Tamil inscription, Perumpadan Kal, identifying it as the property of Perumpadan (Srisuchat, 1996: 250), were part of the goldsmiths’ tool set. An old Javanese text compares the methods used to test the quality of human beings with those employed to test the purity of gold (Hinzler, 1999: 27), and an 11th century inscription provides details of the four ways in which gold may be tested: by using a touchstone, by hammering, cutting, and by melting. 12The earliest reference to the use of cementation to remove silver from the gold is contained in an Indian text known as The Kautiliya Arthasastra, which is believed to have been written by the chief minister of the Mauryean Emperor Chandragupta, who ruled northern India in the fourth century BC (Kangle, 1960). Gold dust or thin hammered sheets were placed in baths of acidic salts, which attacked the silver, forming a silver chloride vapour and leaving a purified gold metal. 13Ornamental gold of the best kind, possessed of excellent colour, passed through an equal amount of lead, turned into leaves by heating made bright with Indus-earth, becomes the base of blue, yellow, white, green and parrot-feather colours (Kangle, 1960: 2.13.47). 14The cupellation with lead would have removed any base metal oxides, and the Indus earth, thought to be a saline soil rich in salt, nitre and ammonium salts which is collected from the Indian river valleys and used for the patination of zinc rich Bidri ware, would have removed the silver. 15For Southeast Asia, there is little analytical data concerning the chemical characterisation of the alloys used. The largest group of analyses is that of the Hunter Thompson Collection of Javanese gold (Miksic, 1990), conducted by Riederer (1994). Although the material in question did not have a certain provenance, Riederer did detect a trend which seemed to suggest that the earlier items in the collection contained a higher ratio of silver to gold. Two scientific studies carried out on the gold finds from Kota Cina in northeast Sumatra, looking at the composition of finished gold sheet and attempting to locate the source of this gold, supported the view that the gold had been retrieved locally (Manning et al., 1980; Swan and Scott, 1986). Provenance studies have suggested that in the 12th century Western Borneo was producing gold which was being transported to the Malay Peninsula (Treloar, 1977). Gold panned from the Sarawak rivers in Borneo has been found to contain traces of antimony with platinum and arsenic (Treloar and Fabris, 1975), gold from Sulawesi may be characterised by the presence of nickel as the only impurity, while gold from Sumatra contains tin, lead and mercury (Stambolov, 1999). However, the chances of successfully matching an object to its source of raw material decreases with the degree of processing and recycling to which the object has been submitted during its manufacture. Also, because gold is never thrown away but has usually been recycled and traded, impurity patterns will generally be far from clear. 16Given the amount of gold available in Southeast Asia, remarkably little archaeological evidence has been found in the late prehistoric sites, and presently none can be dated to a period before 400 BPE. 17Much of the gold retrieved from archaeological sites has not been adequately recorded but, because of its metal value, has been melted or in some cases sold into the art market. Gold beads from the Lopburi Artillery site in Central Thailand were reportedly found in a pre-Dvaravati context (Bennett 1988a: 37; 1988b); hammered sheet gold finds are said to originate from a site near Battambang, west of Angkor. In 1999, Iron Age gold items, which are said to have included a bronze helmet inlaid with gold and gold jewellery, were plundered from the cemetery site of Phum Snay, north of the Tonle Sap in Cambodia2, where about 50 inhumations were discovered and dated from about 100 BPE to 500 PE (O’Reilly and Pheng Sytha, 2001: 265-266; Higham, 2002: 214; Stark, 2004: 96). The analysis of two gold earrings from Phum Snay showed that they had a composition of 70% gold and 30% silver and were possibly manufactured from an alluvial electrum (Hieda et al., 2008: 141; Reinecke et al., 2009b). 18Notwithstanding the objects that may have been lost to looters, the gold finds, together with other highly prized materials recovered from Iron Age sites, suggest that during this period gold was being used as a mark of social rank. At the large Iron Age cemetery site of Noen U-Loke in the Mun Valley, Northeastern Thailand, dated to the 3rd-4th centuries PE, a woman wore a necklace of agate and hollow square-shaped gold beads, together with bronze bangles and bronze and silver finger and toe rings; a man who wore silver ear coils covered in gold leaf was buried with three bronze belts, seventy five bronze bangles on each arm, numerous bronze finger and toe rings, and glass bead necklaces and anklets (Chang, 2001; Higham and Thosarat, 1998: 151-158; Higham, 2004: 63). Figure 3: (See colour plate) The polyhedral gold bead from Khao Sam Kaeo, in eastern peninsular Thailand, is stylistically identical to those from Oc Eo in the Mekong Delta, and to numerous similar beads from Pyu sites in Burma. Figure 3 : (Voir planche couleur) La perle d’or en forme de polyèdre de Khao Sam Kaeo, Est de la Thaïlande péninsulaire, est stylistiquement identique à la perle d’Oc Eo, delta du Mékong, et à beaucoup d’autres perles provenant des sites de Pyu, Burma. 19Earlier protohistoric sites have produced very little gold and, when found, it is usually in the form of a bead or two. Some of the earliest gold was found at the coastal sites of Giong Phet and Giong Ca Vo, in Southern Vietnam, which are dated to the 3rd-2nd century BPE, and which are claimed to be the earliest documented glass manufacturing sites in Vietnam, if not in the whole of Southeast Asia (Nguyen Kim Dung et al., 1995; Nguyen Kim Dung, 2001: 109). 20At the only slightly later sites of Go Ma Voi and Go Mun3, on the banks of Ba Ren river, a branch of the Thu Bon, near Hoi An in Quang Nam province, central Vietnam, Reinecke excavated two gold beads at Go Ma Voi, and recorded beads from the burial ground of Go Mun which were located in the local village collections, together with agate, nephrite and quartz beads, lingling-o earrings, and a bimetallic axe (Reinecke and Lê Duy Son, 2000; Reinecke et al., 2002: 23 and 176). The gold content of the looted bead from Go Mun was 94%, with 5% silver, suggesting that it was made of natural placer gold (Reinecke and Lê Duy Son, 2000). 21Not until the recent excavations at the protohistoric cemetery of Prohear, about 65 km east of Phnom Penh and 40 km west of the Vietnamese border, dated to a period between the 2nd century BPE and the 1st century PE (Reinecke et al., 2009b), did a significant corpus of early gold material which could be analysed exist. In 2007, the site was extensively looted by the villagers, who within a few months had dug up almost the entire cemetery and sold the artefacts, which included gold items and many Dongson bronze drums, on the art market and for scrap metal4 (Reinecke et al., 2009b). Archaeologists were able to photographically document or see photographs of more than fifteen gold or silver objects originating from looted burials, and which had already been or were yet to be sold. Figure 4: Gold beads worn by a woman at the large Iron Age cemetery site of Noen U-Loke in the Mun Valley, Northeastern Thailand, dated to the 3rd-4th century PE. Figure 4 : Perles en or portées par une femme enterrée dans le cimetière de l’Age du Fer du site de Noen U-Loke, vallée de Mun, nord-est de la Thaïlande, datées des iiie-ive siècles PE. 22In the last two years, a scientific excavation along the main village street at Prohear has produced seventy nine gold or silver objects in 52 burials, and has revealed the full extent of the richness of this protohistoric site (Reinecke et al., 2009b). Out of the seventy nine gold and/or silver objects that were excavated, thirty fragments, mostly of small wire spiral rings, were analysed using LA-ICP-MS (Laser Ablation – Inductively Coupled Plasma – Mass Spectrometry) (Schlosser, 2009). The resulting data has indicated that slightly less than half of the objects analysed contained more silver than gold, and suggests that the inhabitants of Prohear were using both a native panned electrum and were also producing intentional alloys. The natural electrum samples contained between 35-44% silver and less than 0.2% copper, while the intentional alloys showed a similar low copper content, but a higher silver content, between 56 and 68%. Platinoid inclusions were present in greater concentration in the intentional alloys with a higher gold content and lower silver content, since the concentration of the platinoids originally contained within the alluvial gold is diluted by the intentional addition of silver. 23The fact that the early inhabitants of the region were engaged in trade as well as manufacture is clearly demonstrated by the finds from Oc Eo, in the Mekong Delta in Southern Vietnam (Malleret, 1959-1963; Vo Si Khai, 2003). Oc Eo is not only one of the earliest commercial centres in Southeast Asia engaged in the trade of a wide range of specialised goods, such as horses and elephants from India, but it is also the earliest excavated site to produce evidence of a gold workshop. Hammers, awls, bivalve casting moulds, droplets of gold, fragments of copper, gold sheet, and partially finished repoussé gold plaques were recovered by Mallaret in 1944. This was accompanied by significant amounts of gold jewellery, including rings, some surmounted by images of Nandi, the sacred bull, linked chains, inscribed gold sheets, gold plaques decorated with repoussé images of Hindu deities, and over nine hundred gold beads with various shapes (Higham, 2002: 233; Le Xuan Diem et al., 1995: 338-365; Malleret, 1962: 41; Manguin, 2004; Miksic, 2003: 18-19). The analysis of a 7 gram gold ingot showed that it contained 19% silver and 5% copper, suggesting that intentional alloying took place prior to the manufacture of the object, and perhaps also suggesting that the gold was traded as an intentional alloy (Malleret, 1962: 460). The only other analysis from Oc Eo was that of a fragment of gold wire, which had a different composition, containing only 5% silver and 1% copper. 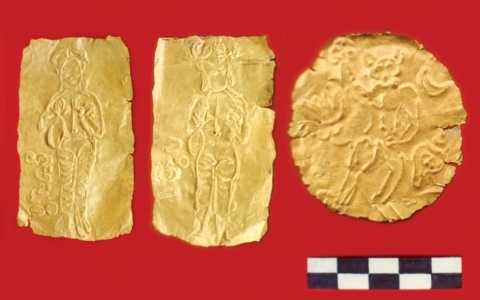 Figure 5: The earliest known Hindu iconographic images in Southeast Asia include three hundred and twenty two gold plaques with simple incised decorations from Go Thap. Figure 5 : Les plus anciennes images iconographiques hindoues connues dans le sud-est de l’Asie incluent trois cents vingt-deux plaques en or avec de simples décorations incisées de Go Thap. 24Another site located in the vicinity, the cemetery of Go Thap, excavated in 2001, produced some of the earliest known Hindu iconographic images in Southeast Asia, including three hundred and twenty two gold plaques with simple incised decorations, depicting turtles representing Vishnu and his mount, the eagle Garuda, water buffaloes, elephants, snakes, conch shells, the sun, plants, and houses on stilts (Fig. 5). Deposited as an offering together with five gold discs, three gold rings, a gold flower, eight precious stones and seven pieces of glass, the site has been dated to a period as early as the 2nd century PE, although Higham dates the site to 400-600 PE (Higham, 2001: 31). 25The large coastal and riverine settlements around Oc Eo in the Mekong Delta (Malleret, 1959-1963; Vo Si Khai, 2003), Giong Ca Vo (Nguyen Kim Dung, 2001) in Southern Vietnam, the early river port of Khao Sam Kaeo in eastern peninsular Thailand (Bellina and Silapanth, 2006), together with the Tabon caves in the Palawan Islands of the Philippines represent the earliest sites yielding gold finds in maritime Southeast Asia. Although the gold finds from these sites have not all been excavated and are often chance finds, recorded in local villagers’ collections, they share many highly characteristic features which provide sufficient evidence to indicate that a trade network linking the areas of the Southeast Asian mainland, the outer islands, the Philippines and India was already in place by the 2nd half of the first millennium BPE. Central knobbed gold beads excavated at Giong Ca Vo (Dang and Vu, 1997: 41, Plate 17), and which have also been recorded at other Sa-Huynh related sites, strongly resemble surface finds from the peninsular site of Khao Sam Kaeo (Pryce et al., 2008: Fig. 14). A gold five-lobed rosette plate, a surface find from Khao Sam Kaeo, is similar to artefacts recovered by Fox from the Guri and Tadyaw Caves of the Tabon complex in the Palawan Islands, which Fox dates to the Early Metal Age (between 500 and 300 BPE) and the Developed Metal Age (100 BPE to 300 PE), respectively (Fox, 1970). Several of the gold ornaments recorded in private collections around Khao Sam Kaeo, including the characteristic polyhedral gold beads (Fig. 3), have also been found in local private collections and bear strong stylistic similarities to finds recorded from Oc Eo (Malleret, 1962: Plate XII), to beads from numerous Pyu sites in Myanmar (Richter, 2000), and to others observed in private collections (Fig. 4) (Pryce et al., 2008: 310). 26The present archaeological evidence indicates an emergent, complex, hierarchical society that was to some degree already in place by the beginning of the Christian era, preceding the development of the early Indic states of the mid-first millennium PE and later. While much archaeological work is still necessary to clarify the socio-economic conditions in the period between 500 BPE and 500 PE, there is ample evidence that mainland Southeast Asian societies were engaged in extensive and sophisticated commercial trading, either directly or indirectly, with India, Central and Western Asia, Insular Southeast Asia and China throughout the last two and a half thousand years. The fact that gold appears in the archaeological record in the second half of the first millennium BPE, at about the same time as iron, semiprecious stone polishing and glass working, suggests that the techniques of gold extraction and working were quite plausibly introduced to Southeast Asia via Indian or Chinese merchants seeking the gold ores available in Southeast Asia. It also seems quite plausible that the conquest of the Upper Thai-Malay Peninsula by the Funan Kingdom, which is clearly mentioned in Chinese texts, may have been stimulated by a desire to control this area’s mineral resources. 27This elaborate international trade network was not a homogenous system, but was rather based on differential economies, which may nonetheless have eventually stimulated local gold panners to retrieve excess metal to be sold in the context of a wider distribution. The rulers of the large coastal and riverine settlements around Oc Eo in the early Funan Kingdom are reported to have sent more than twenty-five missions to China between 226 and 649 PE, bearing gold and other precious gifts. I am very grateful to Dr Bérénice Bellina-Pryce and Praon Silapanth, the directors of the archaeological mission of Khao Sam Kaeo in Eastern Peninsular Thailand for allowing me access to the material from the site, to Kim Dung Nguyen for information concerning Giong Phet and Giong Ca Vo, in Southern Vietnam, to U Win Muang for allowing free access to his collection, and to Charles Higham for allowing me to use the photograph from Noen-U-Locke. I am, as always, deeply indebted to Ian Glover for his help, support and encouragement. Grateful acknowledgements are made to the following for useful discussions and communications: Oliver Pryce, John Guy, John Miksic. Maria Korkel has taken enormous care and trouble in the proofing of this paper and I am most grateful to her. Bellina, B. and Silapanth, P., 2006. Khao Sam Kaeo and the Upper Thai Peninsula: Understanding the mechanism of early trans-Asiatic trade and cultural exchange, in E.A. Bacus, I.C. Glover, V.C. Pigott (eds. ), Uncovering Southeast Asia’s Past – Selected Papers from the Tenth Biennial Conference of the European Association of Southeast Asian Archaeologists. Singapore, National University Press, 379-392. Bennett, A., 1988. Prehistoric copper metallurgy in Central Thailand, in P. Charoenwongsa, B. Bronson (eds. ), Prehistoric Studies: The Stone and Metal Ages in Thailand.Bangkok, Fine Arts Department, 125-135. Bennett, A., 1988.Copper Metallurgy in Central Thailand. Ph.D. dissertation, Institute of Archaeology, University College London. Bronson, B., 1992. Patterns in the early Southeast Asian Metals Trade, in I.C. Glover, P. Suchitta, J. Villiers, (eds. 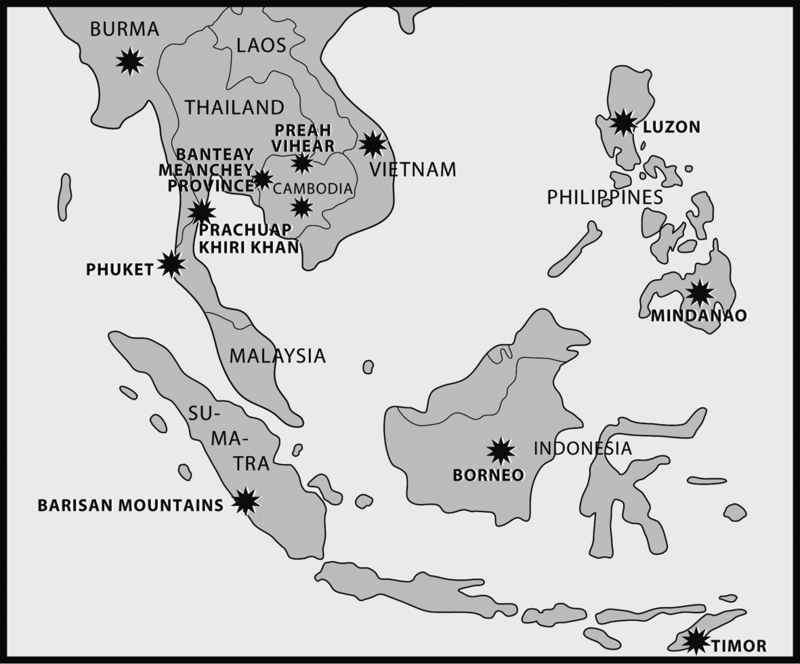 ), Early Metallurgy,Trade and Urban Centres in Thailand and Southeast Asia. Bangkok, White Lotus, 63-114. Chang, N.J., 2001.Personal ornaments in Thai Prehistory, Nong Nor, Bam Lum Khao, and Noen-U-Locke. Unpublished thesis, University of Otago, Dunedin, New Zealand. Cœdès, G., 1968.The Indianized States of Southeast Asia. Honolulu, University Press of Hawaii. Colless, B.E., 1975. Were the gold mines of ancient Java in Borneo? The Sarawak Museum Journal 5(1): 14-22. Dang V.T. and Vu, Q.H., 1977. The excavation at Giong Ca Vo site. Journal of Southeast Asian Archaeology 17: 30-37. Dube, R.K., 2003. Suvarnahumi, Suvarnadvipa: Origin, Identity and its Richness in Gold in Ancient and Medieval Times. Bulletin of the Metals Museum 36: 3-23. Fox, R.B., 1970.The Tabon Caves: Archaeological Explorations and Excavations on Palawan Island, Philippines. Manila, National Museum. Hieda, S., Yoshimitsu, H. and Shigeru, K., 2008. Chemical Composition of Bronze Artifacts Unearthed from Phum Snay Archaeological Site in Cambodia, in Yashuda Yoshinori (ed. ), Final Report on Excavation in Phum Snay in 2007,Chuch Phoeurn eds., Phnom Penh, 133-143 (in Khmer). Higham, C., 2001.The Civilization of Angkor. Berkeley and Los Angeles, University of California Press. Higham, C., 2002.Early Cultures of Mainland Southeast Asia. Bangkok: River Books. Higham, C., 2004. Mainland Southeast Asia from the Neolithic to the Iron Age,in I.C. Glover, P. Bellwood (eds. ), Southeast Asia. From prehistory to history. New York, Routledge Curzon. Higham, C. and Thosarat, R., 1998. Prehistoric Thailand from early settlement to Sukhothai. Bangkok: River Books. Hinzler, H., 1999. Gold and Jewellery in Hindu-Buddhist Java from the 10th to the 15th century, in W.H. Kal (ed. ), Precious Metals in early South East Asia. Amsterdam, Royal Tropical Institute, 27-38. Kangle, R.P., 1960. The Kautiliya Arthasastra. Part II. An English translation with critical and explanatory notes. Bombay, University of Bombay. Le Thi Lien, 2004. The excavations at Minh Su Mound (Go Thap site in Dong Thap province South Vietnam), 2000-2003, proceedings from European Association of Southeast Asian Archaeologists, 10th International Conference, London 14th-17th Sept 2004. Le Xuan Diem, Dao Linh Con, Vo Si Khai and Van Hoa, 1995. Oc Eo. Oc Eo cultures, recent discoveries. Hanoi, Social Science Publishing House (In Vietnamese but with line drawings and photographs of the gold). Majumdar R.C., 1986. Suvarnadvīpa: ancient Indian colonies in the Far East, Vol. 1. 1936, Reprint. Cosmos Publications, New Delhi. Malleret, L., 1959-1963. L’Archéologie du Delta du Mékong, Vols. 1-4. Paris, Ecole Française d’Extrême Orient. Manguin, P, 2004. The archaeology of early maritime polities of Southeast Asia, in I.C. Glover, P. Bellwood (eds. ), Southeast Asia. From prehistory to history. New York, Routledge Curzon, 282-313. Manning, A., McKinnon, E.E. and Treloar, F.E., 1980. Analysis of gold artefacts from Kota Cina site near Medan, Sumatra. Journal of the Malaysian Branch of the Royal Asian Society 53(2): 102-116. Miksic, J., 1990. Old Javanese Gold. Singapore, Ideation. Miksic, J., 1999. Clustered gold finds: hoards or sub-assemblages? in W.H. Kal (ed. ), Precious Metals in early South East Asia. Amsterdam. Royal Tropical Institute, 14-22. Miksic, J., 2003. Introduction: the Beginning of Trade in Ancient Southeast Asia: The Role of Oc Eo and Lower Mekong River, in J.C.M. Khoo, Art and Archaeology of Fu Nan. Bangkok, Orchid Press, 1-34. Miksic, J., 2004. The Classical Culture of Indonesia, in I.C. Glover, P. Bellwood (eds. ), Southeast Asia. From prehistory to history. New York, Routledge Curzon, 234-256. Nguyen, Kim Dung, Trinh Can, Dan Van Thang, Vu Quoc Hien and Nguyen Thi Hau, 1995. Ornaments from jar burial sites in Can Gio District, Ho Chi Minh City. Khao Co Hoc 2: 27-46. Nguyen and Kim Dung, 2001. Jewellery from late prehistoric sites recently excavated in Southern Vietnam in Indo-Pacific Prehistory: The Melaka Papers Volume 5. Bulletin of the Indo-Pacific Prehistory Association 21: 107-113. O’Reilly, D.J.W. and Pheng Sytha, 2001. Recent excavations in northwest Cambodia. Antiquity 75(288): 265-266. Pryce, T., Bellina-Pryce, B. and Bennett, A., 2008. The development of metal technologies in the Upper Thai-Malay Peninsula: initial interpretation of the archaeometallurgical evidence from Khao Sam Kaeo. Bulletin de l’Ecole Française d’Extrême-Orient 93(2006): 295-315. Ray, H.M., 1994. The Winds of change, Buddhism and the maritime links of early South Asia. Delhi, Oxford University Press. Reinecke, A. and Lê Duy Son., 2000. Ein neu entdecktes Gräberfeld der Sa-Huynh-Kultur von Go Mun in Mittelvietnam. Beiträge zur Allgemeinen und Vergleichenden Archäologie 20: 5-43. Reinecke, A., Nguyen Chieu and Lam Thi My Dung., 2002.Neue Entdeckungen zur Sa-Huynh-Kultur. Köln. Linden Soft. Reinecke, A., Laychour, Vin. and Sonetra, Seng., 2009a.Discovered: The rich past of Prey Veng. The Cambodian Scene 41: 40-41. Reinecke, A., Laychour, Vin. and Sonetra, Seng., 2009b. The first Golden Age of Cambodia: Excavation at Prohear. Bonn, Die Deutsche Nationalbibliothek. richter, A., 2000. Jewelry of Southeast Asia. New York, Harry N. Abrams Inc.
Riederer, J., 1994. The technological analysis of early gold objects from Java, in W.H. Kal, (ed. ), Old Javanese Gold (4th-15th century). Amsterdam, Royal Tropical Institute, Tropenmuseum, 46-57. Schlosser, S., 2009. Nothing but gold and silver – it depends on the right mixture, in A. Reinecke, Vin. Laychour, Seng. Sonetra (eds. ), 2009, The first Golden Age of Cambodia: Excavation at Prohear. Bonn, Die Deutsche Nationalbibliothek, 110-116. Srisuchat, A. (ed. ), 1996. Ancient Trades and Cultural Contacts in Southeast Asia. Bangkok, The Office of the National Culture Commission. Stambolov, T., 1999. Gold Mines, ancient Indonesian ornaments and the exact sciences, in W.H. Kal (ed. ), Precious Metals in early South East Asia. Amsterdam, Royal Tropical Institute, Tropenmuseum, 23-26. Stark, M., 2004. Pre-Angkorian Cambodia, in I.C. Glover, P. Bellwood, Southeast Asia. From Prehistory to History. New York, Routledge Curzon, 89-119. Swan, R. and Scott, D., 1986. Gold Work from Kota Cina: a technical study. Southeast Asian Archaeology. B.A.R. International Series. Oxford, Archaeopress, 275-286. Treloar, F.E., 1977. The composition of gold artefacts from Santubong and Gedong, Sarawak. Sarawak Museum Journal 25(46): 9-18. Treloar, F.E. and Fabris, G.J., 1975. Evidence for the contemporary existence of two Kedah sites. Journal of the Malaysian Branch of the Royal Asian Society 48: 74-76. UCR, 2009. University of California, Riverside, CA 92521. At http://lists.ucr.edu, April 2009. Vo Si Khai, 2003. The kingdom of Fu Nan and the Culture of Oc Eo, in J.C.M. Khoo, Art and Archaeology of Fu Nan. Bangkok, Orchid Press, 35-86. Wahyono M., 1994. The gold of Wonoboyo, in W.H. Kal (ed. ), Old Javanese Gold (4th-15th century). Amsterdam, Royal Tropical Institute, 30-45. Wahyono M., 1999. Der Goldschatz von Plosokuning, in W.H. Kal (ed. ), Precious Metals in early South East Asia. Amsterdam, Royal Tropical Institute, 73-76. Workman, D.R., 1972. Mineral Resources of the Lower Mekong Basin and Adjacent Areas of Khmer Republic Laos, Thailand and Republic of Viet-Nam. Mineral resources Development 39. Bangkok and New York, Economic Commission for Asia and the Far East, United Nations. 1 In 2008/2009 there has been some revival of gold mining in Thailand, and one or two old locations are being reinvestigated (Bangkok Post). 2 The site, which is in the Preah Net Preah district of Banteay Mean Chey Province, Cambodia, was excavated in 2001 by O’Reilly and Pheng Sytha (2001), and, although they found no gold, they confirmed it as a rich Iron Age cemetery with military paraphernalia. 3 These are the sites which are linked by river to Kham Duc, 65 km northeast, an area where gold mining is still undertaken today and where evidence of ancient shafts have been reported (villagers, pers. comm.). 4 The villagers of Prohear sold the iron offerings they found in the burials for 900 Riels (0.2 US $) per kilo to the scrap yard (Reinecke et al., 2009b). Figure 1: Map showing the gold producing regions of Southeast Asia.Figure 1 : Carte avec localisation des régions productrices d’or du Sud-est de l’Asie. 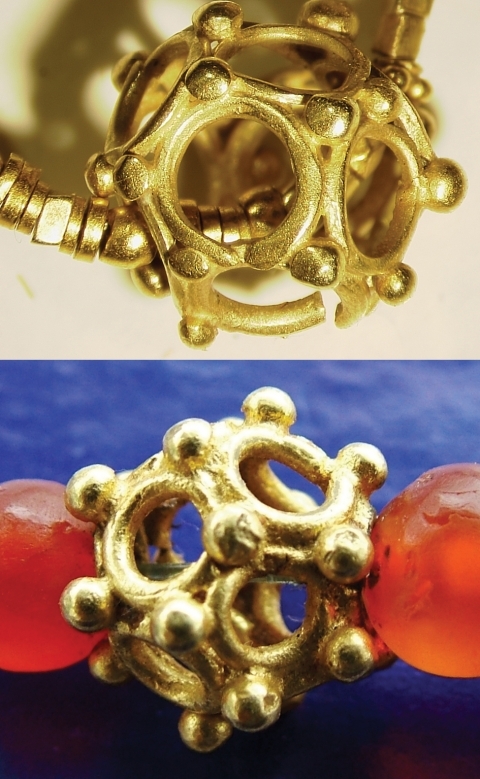 Figure 2: Myanmar jeweller producing gold beads which stylistically replicate ancient ones.Figure 2 : Orfèvre à Myanmar fabricant des perles en or stylistiquement identiques aux anciennes. Figure 3: (See colour plate) The polyhedral gold bead from Khao Sam Kaeo, in eastern peninsular Thailand, is stylistically identical to those from Oc Eo in the Mekong Delta, and to numerous similar beads from Pyu sites in Burma.Figure 3 : (Voir planche couleur) La perle d’or en forme de polyèdre de Khao Sam Kaeo, Est de la Thaïlande péninsulaire, est stylistiquement identique à la perle d’Oc Eo, delta du Mékong, et à beaucoup d’autres perles provenant des sites de Pyu, Burma. 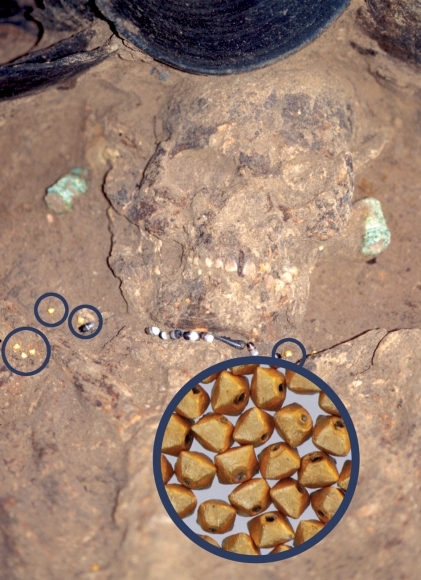 Figure 4: Gold beads worn by a woman at the large Iron Age cemetery site of Noen U-Loke in the Mun Valley, Northeastern Thailand, dated to the 3rd-4th century PE.Figure 4 : Perles en or portées par une femme enterrée dans le cimetière de l’Age du Fer du site de Noen U-Loke, vallée de Mun, nord-est de la Thaïlande, datées des iiie-ive siècles PE. Figure 5: The earliest known Hindu iconographic images in Southeast Asia include three hundred and twenty two gold plaques with simple incised decorations from Go Thap.Figure 5 : Les plus anciennes images iconographiques hindoues connues dans le sud-est de l’Asie incluent trois cents vingt-deux plaques en or avec de simples décorations incisées de Go Thap. Anna T. N. Bennett, « Gold in early Southeast Asia », ArcheoSciences, 33 | 2009, 99-107.